Facing match point against the top seed, up-and-coming tennis player Connor Hance was trying his best to dig himself out of a hole. The 14-year-old had dropped the first set in the Asics Easter Bowl finals and, trailing 6-5 in the second set, was looking for a ray of hope. He got it when John McNally, of Cincinnati, double faulted giving Hance the opportunity he needed. He scored the next two point to force a tiebreaker and proceeded to win championship with a 4-6, 7-6 (3), 6-4 victory. Hance’s career on the tennis court has since flourished. The 5-foot-10, 160-pound right hander is ranked No. 21 in the nation in the Boys 18 Singles division and in April, became the first boys tennis player from Peninsula High to win the CIF singles division title at the prestigious Ojai Tournament. The junior’s victory over Corona del Mar senior Bjorn Hoffmann helped Peninsula finish in a first-place tie with San Marino for the team title. In May, Peninsula and San Marino would square off in the finals of the CIF-Southern Section Division 1 team championships. Hance led the Panthers to a 10-8 victory and Peninsula’s first CIF championship in boys tennis since 2000. Peninsula head coach Mike Hoeger said Hance has a style similar to 2012 Olympic gold medalist Andy Murray. Hoeger expects Hance to return for his senior season in hopes of winning the CIF Individual Singles title. Hance said his short-term goals are to play well in tournaments, keep improving his game and next spring help Peninsula win back-to-back CIF championships while claiming the elusive CIF Individual Singles title. Hance said the two toughest opponents he faced this year have been Hoffman, who won the CIF Individual title, and Alex Kuperstein of Palm Desert, who defeated Hance in the semifinals. Hance comes from a tennis family. His father, Ken, has been involved in tennis in the South Bay since 1976 and is Director of Junior Tennis at the Peninsula Racquet Club. Connor’s mother, Courtney has been teaching tennis for more than 20 years and was the No. 1 player at UC Irvine all four years. She and Ken founded South Bay Tennis Club 19 years ago and it became a second home for their four children. When Connor was 5-years-old, he was cast as the son of tennis greats Andre Agassi and Steffi Graf in a television commercial. Connor began playing in tournaments when he was 6 years old and by the age of 10 started to take the sport seriously. Along with a devastating backhand, Hance feels one of his strengths is his ability to wear down his opponent. 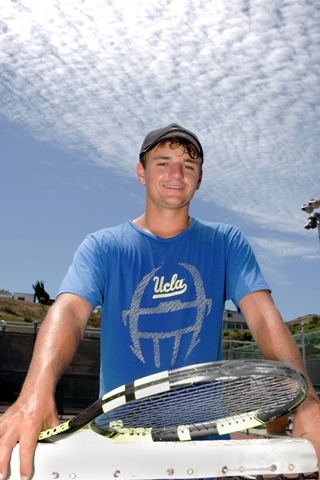 In June, at the USTA SoCal Jr. Sectional Championships, a sore wrist forced Hance to withdraw from the tournament after winning his first four matches. Later that night, Courtney heard a noise coming from the street. The nutrition-conscious Hance spends three to five hours each day on the court but his workout does not end there. After returning home from practice, Hance will either run or drive to the beach where he works in the sand on movement, quickness and sprints. Hance is coming off a win at the Manhattan Beach Tennis Open where he played “just for fun” with friend Joseph Rotheram, of Manhattan Beach. The pair captured the Men’s Open Doubles championship. As the level of competition increases, Hance has learned to cope with pressure, finding something in the match to focus on so nerves don’t get the best of him. Tennis has provided Hance the opportunity to travel while playing in tournaments across the country. Hance will return to Kalamazoo for the Boys 18s National Championships Aug. 5-14. He said the highlight of his career came two years ago when he reached the finals in the 16s tournament at Kalamazoo. He’ll later represent Southern California at the Junior Team Tennis National Championships in South Carolina Oct 20-23, where regions compete for the title. Hance hopes the stiff competition will help prepare him for his college career at UCLA. The Bruin head coach is Billy Martin, a 1974 graduate of Palos Verdes High School who won the NCAA Singles championship in 1975 before turning pro. Numerous universities were interested in Hance, including Stanford and USC, but he chose UCLA because of its proximity and balance of athletics and academics. Free time is rare for Hance but he takes advantage of it when it occurs, hanging out with friends or playing guitar. Hance said his mother, Courtney, has been the biggest overall influence in his life. He enjoys the fact that older sister Kenadi, 19, younger sister Kimmi, 13, and brother Keaton, 8, all love tennis. Kenadi, like Connor, was a CIF champion at Peninsula High. As a freshman at the University of Washington last fall, she finished second on the team with 11 dual match wins in singles. She also was a five-time USTA National Champion. The Palos Verdes Peninsula has been a breeding ground for tennis players, including greats of the game Tracy Austin, Pete Sampras and Lindsay Davenport. Hance hopes one day to join that list.